We are now back in flat Florida following a three day adventure in New Hampshire via Boston (Somerville, to be more exact). After a bumpy flight, we checked into our AirBnB. For those of you not in the know, wannabe hoteliers or innkeepers who have enrolled in the program can let out their spare room – or their whole apartment or house if it’s going to be vacant – for varying lengths of time and at reasonable rates. Our 20 something daughter had urged us to try it. Of course, it’s an app. Once we got used to the idea that we were staying in someone else’s temporarily empty studio apartment – surrounded by all their books and other possessions – it worked out well. I guess we should have tried Uber on this trip as well. A Portuguese breakfast – climbing food? 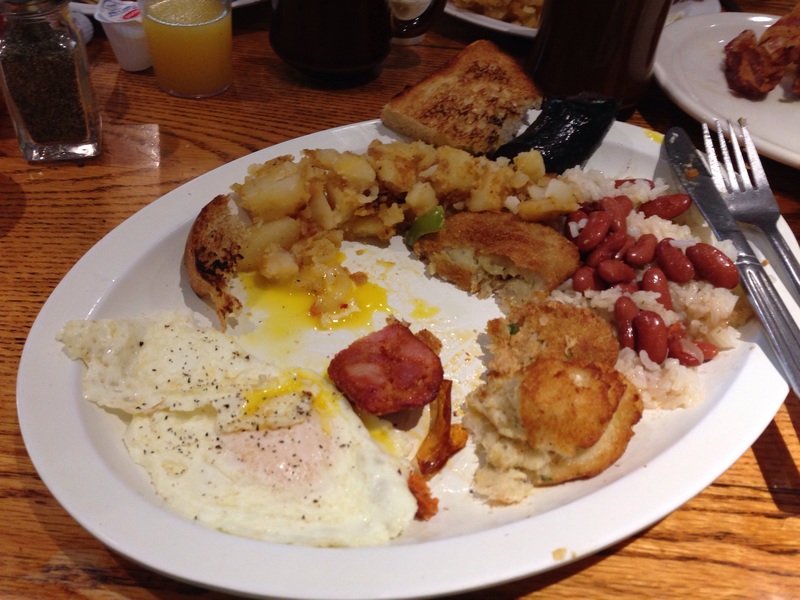 After breakfast at a Portuguese restaurant – which involved cod, shrimp and fish cakes, rice and beans – the husband, the older daughter, her boyfriend and I left rainy Boston for the three hour drive to Jackson. Our transportation was the boyfriend’s aged Previa minivan with 168,000 miles, including at least two trans-continental trips. As we got closer to New Hampshire the grey clouds lifted and we entered Jackson under crystal clear blue skies – as well as a city-worthy traffic jam in North Conway. We clearly weren’t the only people with the idea of a long New Hampshire fall weekend. We stayed at the Inn at Jackson, the former vacation home of the Baldwin family (as in pianos, for you musicians out there). 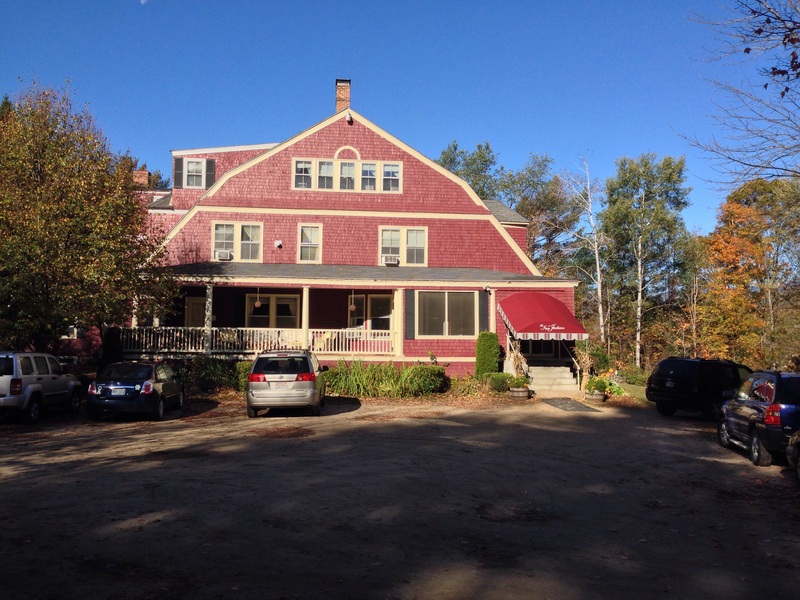 Charming rooms with a very nice communal living room, roaring fire, board games, and all of the things that we Floridians associate with fall in New England. That night we had dinner at The Wentworth, a sprawling hotel coping with what seemed to be an unexpectedly large number of diners. Sunday morning was our summit day. Our hosts had kindly put out breakfast food for us since we were hoping for an early departure – but somehow – due more to the husband and me than the other two members of our party – we still didn’t take off until 30 minutes later than planned – a pattern that unfortunately pervaded the entire climb. 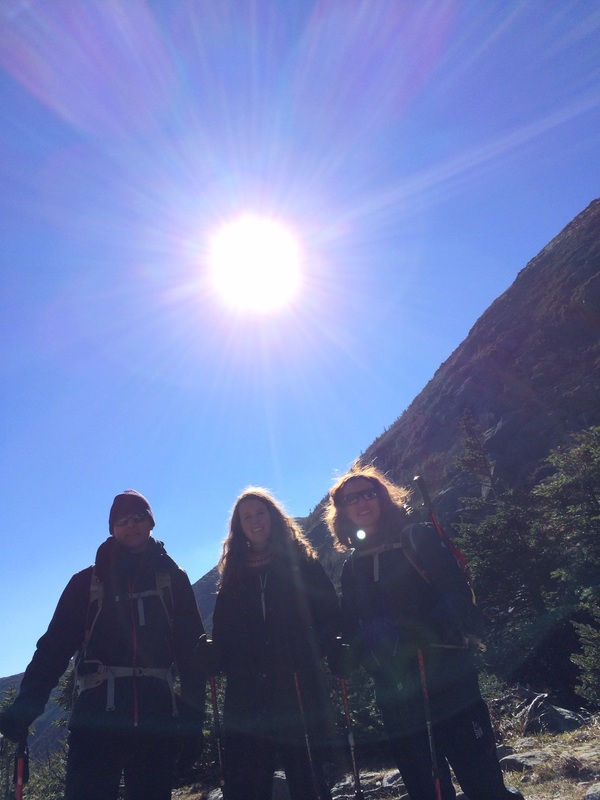 We started from Pinkham Notch visitors center. The boyfriend bought me a three dollar map – which my daughter had said would make me happy. It did that, but more importantly, it actually served a much-needed traditional map function later in the day. 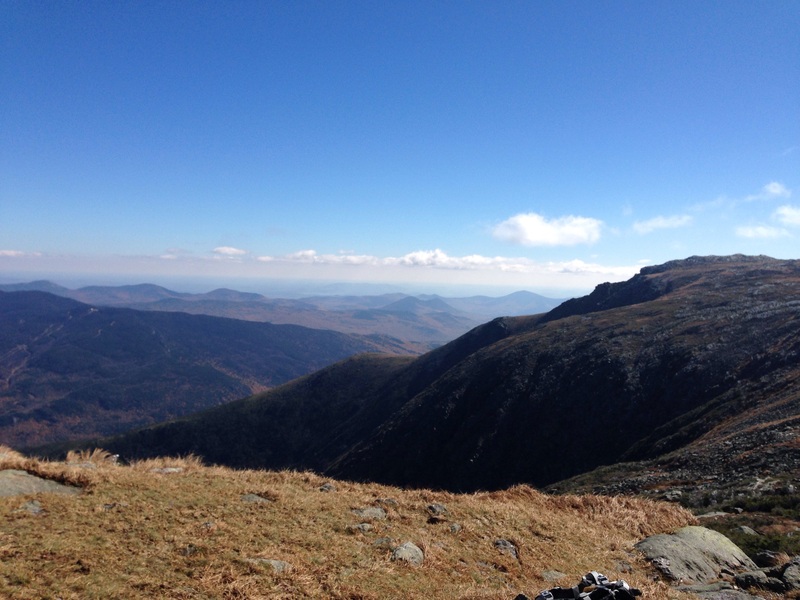 Mount Washington – and the Tuckerman Ravine Trail in particular- is rocky. The first couple of miles consisted of a wide path of semi steep ascents over what looked to be a rocky river bed. The half way point was Hermit Lake Shelter. Ironically, that was the windiest point of the whole day and caused us all to don extra layers that we spent the next few hours shedding. We stopped there for a mid morning snack. We may have been the only people climbing the mountain with a loaf of whole wheat bread, a hunk of cheese, a hunk of salami and a full jar of grey poupon mustard. Oh, and we had some left over GUs from Elbrus. We had spectacular weather. Most of what I had read about Mount Washington had focused primarily on the horrible weather and didn’t spend much time at all on the difficulty of the trail. So while we were very prepared – in fact, over prepared – for the weather, we hadn’t actually taken into account the steepness and rockiness of the trail. After the half way point, we basically spent the next couple of hours scrambling up large boulders, some of which were quite wet from the waterfalls and streams that cross the trail. We were also slowed by the hordes of international tourists speeding up to the summit in terribly coordinated hiking outfits whom we felt compelled to let pass. In retrospect, we might have been better off had we been less polite. And speaking of clothes – the ill-fated pants with the dysfunctional zipper (see earlier blog entries) reared their ugly legs again. I swear this was their last excursion. About an hour or so from the summit I realized the pants were constricting my left knee every time I stepped up – to the point I had developed a good sized blue bruise right below my knee. Finally I gave in, recognized the pants for what they were and stripped down to my light weight hiking pants that I had the foresight to wear underneath. My mobility increased enormously. We finally reached the summit about 2 or so – well later than we should have, given that sunset was at 6:05. Nonetheless, we stopped for a while and had some hot tea in addition to our second meal of salami and cheese. The summit is a total tourist area. There’s a train that chugs its way up there. Others drive up on the “auto road,” and of course there are scores of people who actually climbed. There’s a museum, a gift shop and a snack bar. Remote, it is not. Finally we started back down. 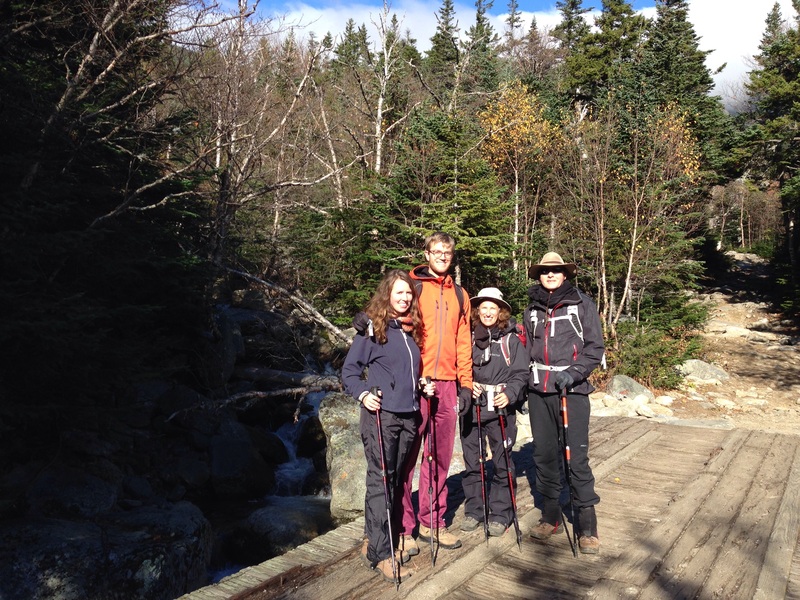 We took Tuckerman Ravine Trail for a little bit, then veered left to the Lion Head trail. All of a sudden the crowds thinned, and the landscape grew wilder. It was much steeper than the other trail, and marked almost exclusively by stone cairns. We hiked through tunnels of dwarfed evergreens and slid ourselves down several rock chimneys. A number of the drops were steep enough that the daughter and I resorted to the good old fashioned sit down on your rear method of descent. At a couple of points the trail seemed to disappear into nothingness at the edge of a cliff – and all of a sudden you’d see a tiny little path down. Eventually that trail arrives back at Hermit Lake Shelter and rejoins Tuckerman Ravine Trail – at which point we realized we were out of water. We’d made a really stupid mistake of not refilling our bottles at tourist central at the summit, thinking we had enough. The boyfriend valiantly volunteered to run what we thought was a short distance to the water pump – only to find it wasn’t a very short distance and the pump required numerous pumps before anything came out of it. By then it was clear the sun was rapidly on its way down and we got out our headlamps to be ready. We were now off the steeper and more beautiful trail back to the river bed of rocks. Actually there was a real river beside us much of the way. I finally took the lead since down is usually my strong suit – that is, when I am not having to slide down rocks on my rear – and we made extremely good time at first. Still, the only other people on the mountain now seemed to be professional trail runners who literally jumped over the rocks like moths flitting from light to light. Once the sun was down, any pretense we’d had to speed was done – one wrong step and turn of the ankle and that would be it. In the dark it’s easy to question where you are – especially since I had a strong tendency to want to follow the water runoffs – which looked awfully trail like to me – and the daughter seemed to want to turn right regardless of location. The three dollar map became very useful to provide some confirmation we were actually heading in the direction of the lights from the visitors center that occasionally flickered in the distance. Finally – and almost suddenly – our journey through the night ended and there we were at the Previa. Injuries : some blisters – daughter and boyfriend; bruises – daughter and me (both banging legs on rocks and pants injury). Damaged equipment – somehow the daughter’s hiking pole had flipped open, the bottom part fell off, and she didn’t notice until we were at the bottom! She said it had seemed a little shorter. A Black Diamond, no less. Rewards: meeting a challenge head on with a team that included not just the husband and me but the daughter and boyfriend. When the husband and I are old and grey and sitting by the fire I hope they’ll remember we weren’t always that way. So, lessons learned. In the broader scheme of things the husband and I remembered we really like sheer mountain climbing better than rock climbing – which can still sometimes trigger my innate fear of heights. We are rethinking the Grand Teton and are now seriously thinking again about Cotopaxi in Ecuador. It’s another almost 20,000 foot glaciated mountain that is awfully appealing. And on the smaller scale of things we were reminded that you can make stupid mistakes on even 6200 foot mountains and regardless of how many you’ve climbed. You’ve got to be humble in the face of a mountain.